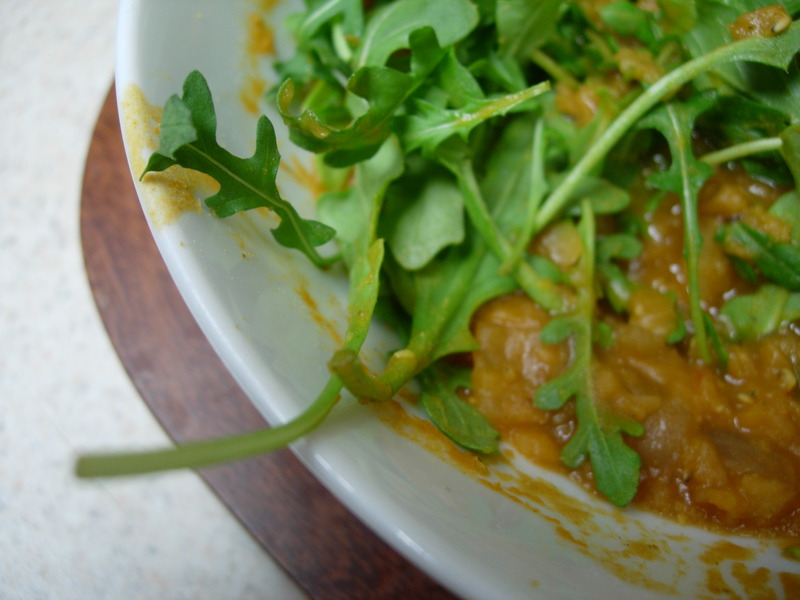 A strangely delicious mix: red lentil dhal with fresh baby arugula. This was one of those moments where the fridge contents guided the innovation. Not only was the arugula begging to be finished off, but we were out of tomato paste (which I normally use in red dhal) and no hot peppers to be found, either. Substituting jarred spaghetti sauce for tomato paste yielded a much sweeter dhal than usual. And since my eating style typically involves throwing everything into one big bowl, I found out that the sweet spiciness played beautifully with the peppery, bright greens. Hope y’all’s week is off to a good start. oh, what a bounty! Arugula, and these colors together, are so luxurious.